Students pull down the curtain to reveal their finished mural. The painting was designed and painted by Bridge Academy students with help from the Art Partners Studio. Art is always more than just art. At its best, art captures consciousness, the present that the artists exist in, the past that has shaped it, and the future that the artists hope to impact. The students at the Bridge Academy did just that with the mural they unveiled at their community center Monday night. 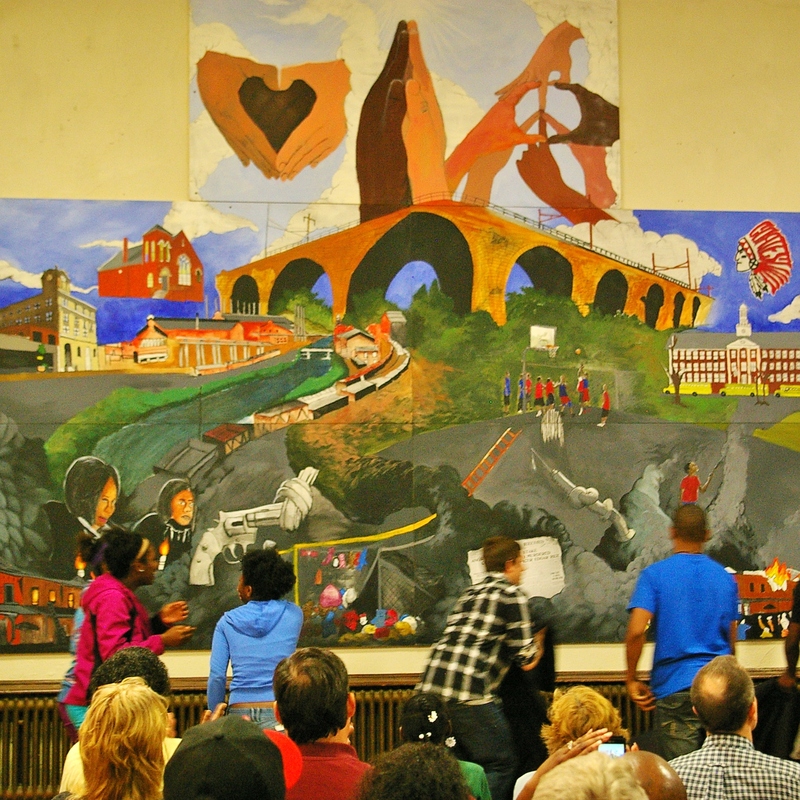 The unveiling of the mural, titled “Darkness to Light”, culminated a 30-week long effort where Bridge Academy students, with help from the Art Partners Studio, brainstormed, designed, and painted the 160-square foot piece, which depicts the city’s past, present, and future. “Our kids fell in love with the idea of a mural. We asked them what they wanted to do, and they started listing all these things about Coatesville,” said Bridge Academy Executive Director Jordan Crans. “All the things you’ll see came from the kids, what they saw, and what they wanted to see. Under the guidance Shawn Wanner, a muralist and painter with the Art Partners Studio, the students began brainstorming in October. 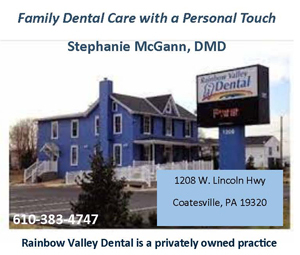 “We talked about images we wanted to see of Coatesville. We got a lot of dark things and a lot of the good things, too,” he said. Wanner insisted that he only played facilitator; the students provided the creativity. Students Dondre Pittman and Nasir Newton talk about the process of creating the mural as Bridge Academy Executive Director Jordan Crans looks on. Divided into three layers, the bottom of the mural depicts events from Coatesville’s past, including the arsons and a newspaper headline about the Zachariah Walker lynching. This bottom layer, which represents the ‘darkness’ theme is an unflinching illustration of the hardships that Coatesville has faced throughout its history, struggles that are reality for much of the city’s youth. Students chose to portray these difficult images as reminders of the negative effects that they had on the community. “The violence that had been in our community hurts everyone involved,” said student Pedra Jennings. The middle layer shows Coatesville as it is today, capturing landmarks like Lukens Steel and Scott Middle School. This section captures the city as students see it every day, shared images that help to form a sense of collective consciousness. “People need to realize it’s [the city] not about people on corners selling drugs,” said student Nasir Newton. 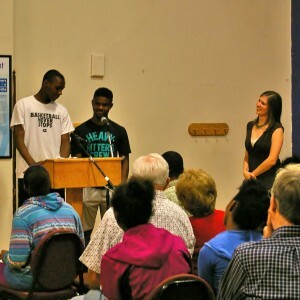 To him, pictures of the Bridge Academy and kids playing basketball represent community. The top set of images shows hands. Two combine to make a heart. Another set makes a peace sign. Using different skin tones, the students wanted to show their hopes for the city. 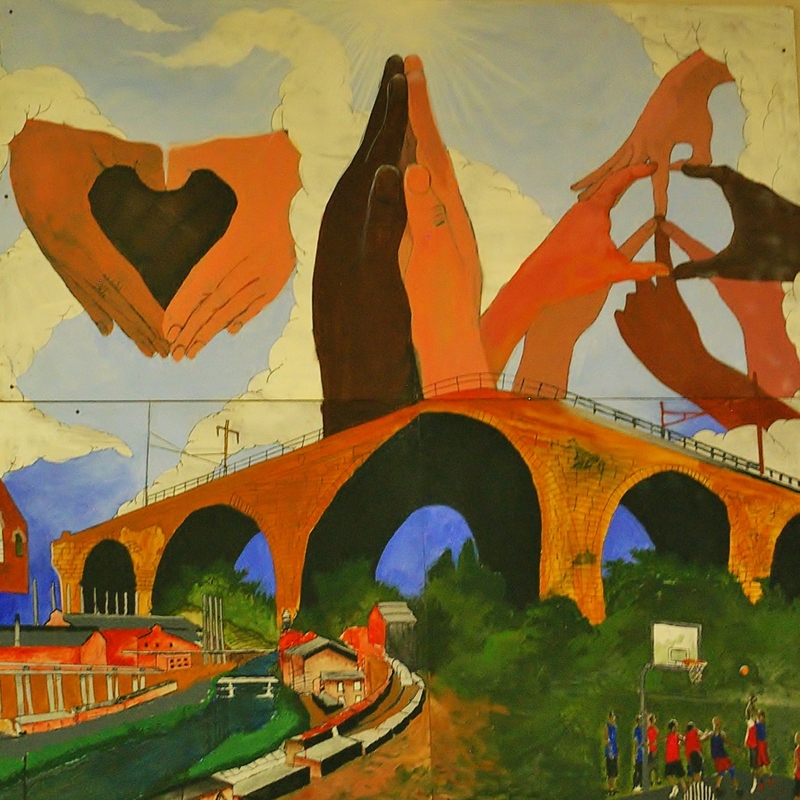 The upper parts of the mural show landmarks from the city as it is today with the students’ hopes for the future above. 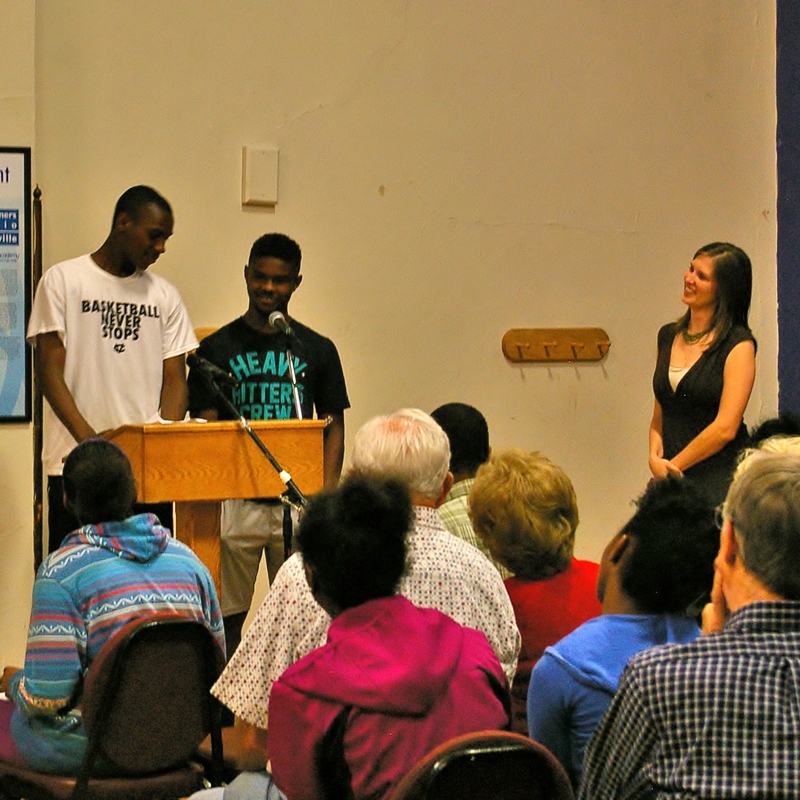 “We were talking about how we wanted Coatesville to be a better place and stop violence. They represent all the races so we can come together and love each other,” said Newton. Just as important as the end result was the process of working on and completing the piece. The students, most of whom had no previous experience in art, worked and learned together. Wanner said that by the end of the process, he felt like they became a family. “Our teamwork actually ended up becoming a little version of what we want to see happen in Coatesville—we don’t want to just try to get by, we want to make an effort to make it good,” read a sign accompanying the piece. Many of the students emphasized this sentiment. They talked about how working on such a project helped them grow as people. Newton said that he never saw himself as an artist, but collaborating with his friends has changed him as a person. From the earliest cave paintings to today’s post-postmodern conceptual pieces, art exists to change people, both the creators and the viewers. The students of the Bridge Academy grew and changed in the process of finishing their work. They produced a mural that puts a human face tragedy, captured the suffering of a community’s soul. Doing this, they proclaimed themselves not just statistics of a city affected by violence or a youth growing up in a dismal economy; they proclaimed themselves as real people. Their images remind us why it is important to remember the past, and their humanity reminds us why we have to make the future better.